Last weekend was really lovely – my mom was in town! I dragged her all over Brooklyn by foot and by ferry and as per usual we spent most of our time eating. Saturday night, my cousin joined us for dinner at a delicious restaurant in Brooklyn Heights called Colonie. I love restaurants that are conducive to sharing and Colonie’s menu is tailored for just that. We ordered far too many dishes, but we devoured them all. 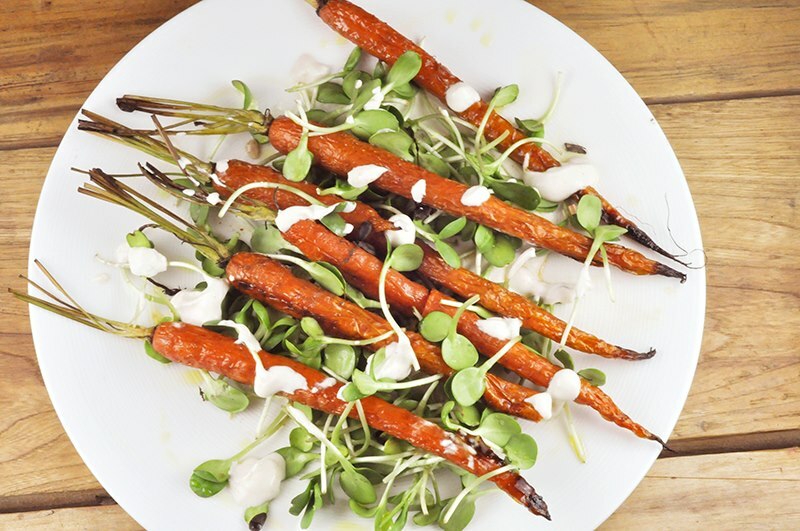 One of the standout plates on our table was a roasted carrot salad with sunflower sprouts. This was my first introduction to these slightly sweet, watery little greens and I loved them. I adore a dish with simple ingredients that balance together perfectly and that’s what happened when I put a little bit of each ingredient on my fork. When I came across sunflower sprouts at the market this week, I decided to try to recreate this dish. Pre-heat oven to 400 degrees. Toss carrots with olive oil and maple syrup and place in oven to roast for 30-40 minutes or until soft. While carrots are roasting, cut garlic cloves into thin slices. Heat olive oil over high heat in a small pan and add the garlic slices and cook until they begin to brown. Remove garlic and place them on a paper towel to cool. In another small pan, toast almond slices over medium heat for 10 minutes, making sure they don’t burn, remove and set aside to cool. To make the sauce, combine all ingredients and whisk together. Once carrots are done, remove and set aside to cool. Drizzle some of the sauce on a plate, add some sunflower sprouts, top with the carrots, garlic chips and almonds and top with more sauce. Drizzle a little extra lemon and olive oil on top. Grab and fork and knife and dig in! This entry was posted in Recipes and tagged Agave, almonds, carrots, extra virgin olive oil, garlic, Greek Yogurt, lemon, lemon salt, maple syrup, paprika, sunflower sprouts.